No changes have taken place since 1990 in terms of company ownership but there have been a number of physical changes of location. The Diesel part of the Allen company continued under the Rolls Royce Power Engineering umbrella and continued to produce new designs and these proved successful. The designs were done in Bedford in the old Queens Works offices. Manufacturing continued at Queens but it contracted rapidly and most manufacturing was moved to other plants away from Bedford. Eventually it was apparent that with a decreasing staff level the whole of the Queens Works site including the 1957 office block was no longer required and the whole lot was sold. The remaining office staff moved across town to Brickhill Drive into part of what was Pilgrims School. From September 2010 the Diesel division split in two and the Allen side of the company became Allen Diesels Ltd.
Allen Diesels purchased the intellectual property, technical information and know-how owned by Rolls Royce Power Engineering UK (RRPE) and used in the business relating to the Allen diesel, gas and crude oil burning engines manufactured by RRPE UK, or previously by W H Allen. Allen Diesels Ltd continue to operate from the same premises in Bedford under the control of Director Paul Knight and General Manager Roger Smyth. The Allen Design Team is led by Chief Designer, David Ayres. The Technical Services Support Team is in the care of the Head of Technical Services Support, Phil Mann, and Spares Manager, Mick Panter, heads up the Spares division. A total of 28 employees have gone with the sale to Allen Diesels Limited. Allen Diesels have also procured the complete stock of Allen engine spare parts previously held by RRPE and are committed to continuing to provide the fast and efficient supply of spare parts that their clients have come to expect. Around 16 employees are still employed by RRPE including New Engine Sales, Main Plant Projects, Applications, Drawing Office and Finance. These all now selling only Bergen manufactured engine projects. The Pump Division was sold off by Rolls Royce. The major part was sold to Weir Pumps. A group of Allen managers bought the ‘small pump’ operation and, together with some Allen staff, started a new company in Bedford named Bedford Pumps. This company still operates in Kempston, just a few miles from Queens Works. Allen Steam Turbines, who started by operating a service and spares operation within the Queens site. In 1999, during ownership by Rolls-Royce plc, the decision was taken to focus on turbine refurbishment, support and maintenance rather than commercial manufacture. In 2001 Allen Steam Turbines became part of Weir Power & Industrial, and the new company re-located to a new industrial unit between Clapham and Oakley, still alongside the old LMS line about 3 miles north of Queens Works. From this site they provide Site Engineering Support, Design and Analysis, Technical Support and Spares Supply to customers in varying industries including Sugar, Waste to Energy, Paper and Pulp and Naval Marine. To complement these support services, Allen SteamTurbines, who own the rights and drawings of the entire Allen turbine production, now offers a competitive range of single and multistage steam turbines manufactured by their partner, NG Metalúrgica of Brazil, which have been evolved directly from the Allen turbine design. In 2008 a management team buy-out was completed for the acquisition of Allen Gears, the world-leading UK business that provides high-integrity gearboxes and gearbox services for the power generation, oil and gas and marine industries, from Rolls Royce. Kevin Johnson, Managing Director of Allen Gears, completed the buy-out in association with Paul Cartwright, Finance and Services Director, and Jason Watkiss, Technical and Operations Director. The business, which employs 190 staff at its Pershore headquarters and has technical and engineering representatives based within prime market areas worldwide, took the name Allen Gearing Solutions Ltd and will trade as Allen Gears. After closure the works was totally demolished with only the Allen Club on Hurst Grove and the 1957 office block on Old Ford End Road remaining. 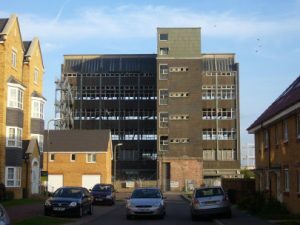 It was hoped that the office block could be refurbished and be let out as offices but with no space for car parking and the level of decay since closure it was not long before this too was demolished in 2009. Only the Allen Club seemed destined to remain and this was opened to all residents of Queens Park. It ran for seven years as a Social Club with financial assistance from both Rolls Royce and the site development company. At the end of 2009 the trustees decided that the operation was not a viable entity and the Allen Club closed its doors for the last time in early 2010. The Heritage group together with representatives from Bedford Museum gathered up a few remaining artefacts before the closure. The site was due for demolition and the building of five houses, but at the last minute an attempt was made to save the building for use as a place of worship and retail outlet. 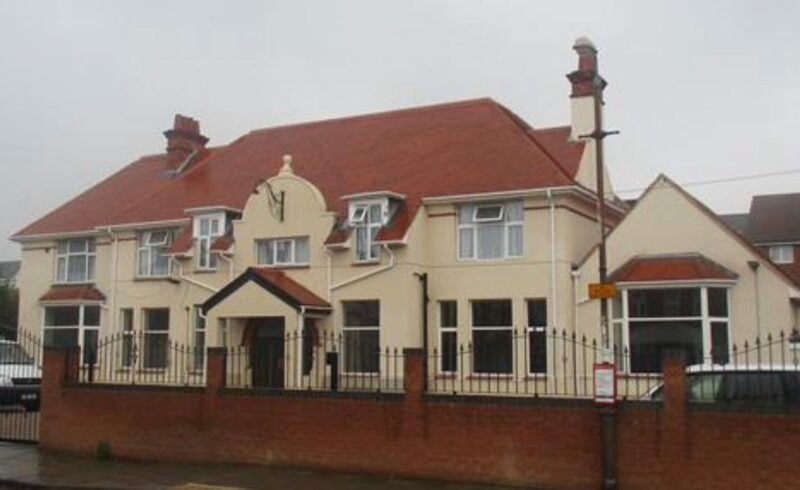 However this was refused by Bedford Borough Council and The Allen Club was refurbished and sold. 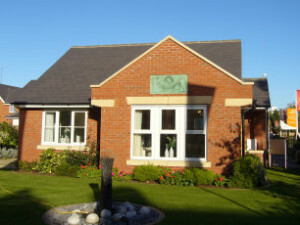 In 2016 planning permission was granted for conversion into a care home for people with complex needs such as learning disabilities and autism. At ground floor level there are 6 bedrooms and at first floor level there are 3 self-contained flats. Most of the outside of the building remains unchanged apart from minor changes to the left hand elevation windows. No doubt William Henry Allen would have approved of this legacy to the community of Bedford. 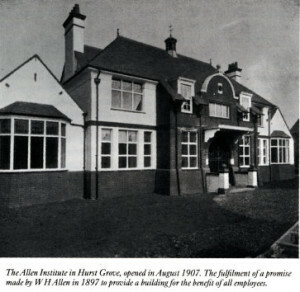 With the office block gone and the Allen Club building now a care home, it would easily be assumed that all evidence of Allens’ presence in Queens Park, Bedford, has all gone. However there are a few clues around the Queens Works site. 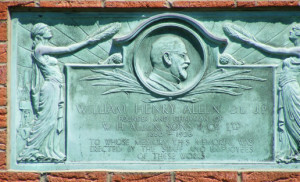 The large plaque that resided in the wall of the new office block in memory of William Henry Allen was removed from the wall and now resides in the gable end of a bungalow on Hurst Grove at the entrance to the housing development roughly where the works canteen stood. 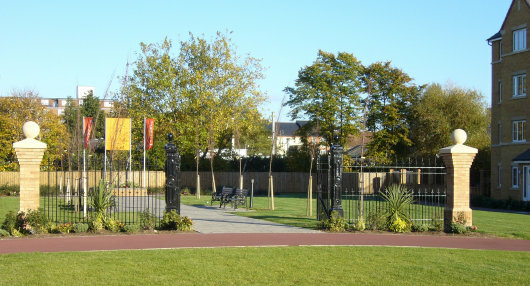 The main gates from the Ford End Road entrance now stand, fully restored, in a pleasant park area in the middle of the housing development. The high rise block in the left distance is the post war flats on Ashburnham Road. The railway line is behind the fence at the far end of park. John Westbeech Kempster (1864-1947) was the Manager and Chief Electrician who gave 15 years of service to WH Allen from 1887-1902. He went on to become Chairman of Harland & Wolff in Belfast, which speaks well of his earlier training and experience at Queen’s Engineering Works and no doubt produced beneficial side effects for Allens. George Robert Henley (1863-1919) was the Company Secretary from 1900 when WH Allens became a Limited Liability Company, through to his death in 1919. He had also been with William Henry Allen since the early days in York Street, Lambeth, London. Percy Barby Crowe (1863-1933) was for many years a colonel in the Territorial Army, commanding the 1st Battalion of the Royal Fusiliers. He was elected to the WH Allen board in 1908 and served until 1932. His particular interest was in dock-pumping plant. He was also William Henry Allen’s son in law, having married his eldest daughter Annie.